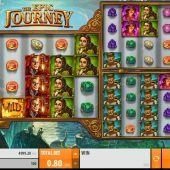 The Epic Journey slot is possibly the glossiest and most adventurous game Quickspin have produced which befits the Jules Verne type of fantasy theme we open the slot to. You have elements of Games Warehouse's Castles In The Clouds combined with the multiple reel sets of WMS's Gems Gems Gems, the game being set over a mythical landscape and accompanying classical music to soothe your journey. There's no doubt going to be pitfalls and perils on this adventure, but will we return from these travels broken or enriched? Well, I mentioned reel sets and we have a main set of 5 reels and 4 rows on the left with 40 paylines. On the right are two more identical grids but with only 30 lines each so we have overall a 100-line game for which we pay 80 coins per play. 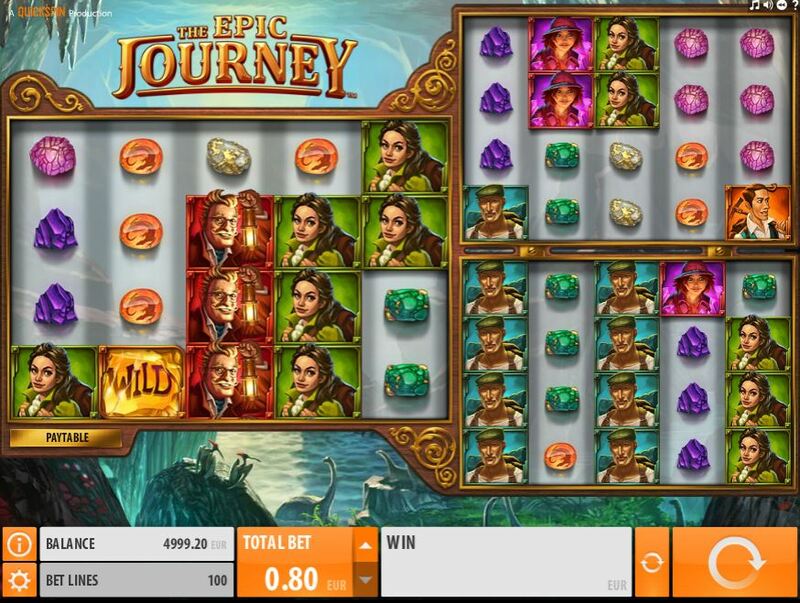 With this format you'll never see huge awards for symbols, especially when they all appear stacked up to 4 rows high including the Wilds which offer the best 5-of-a-kind win at 500 coins, 6.25x our 80-coin bet. You then have the characters of the Professor, Explorer and his Female counterpart paying 100 coins and Female and Male hikers 50 with no card values but instead 5 different gemstones all awarding 20 coins for a full line. We guessed there would be perils and indeed there is a very explosive one, a Volcano on reel 3 of all the grids. If you see two or three then they will erupt in turn spewing out lava bombs into random positions on the 3 sets and usually creating a big win! Mushroom Forest - pick 3 mushrooms and get multiples of stake and/or extra picks each time until you run out of picks. Nearly as bad as the coin win above. Fossil Hunt - you get a fossil behind the reels and 3 spins to land as many shovels over the grid as possible. They lock for the remaining spins and at the end you get a stake multiplier depending on the amount of the fossil you revealed. You thought it'd get better? Safari Spins - that's better, a free games bonus! There is a special Golden Animal Wild added to each grid on the centre reels. Collect 3 of any to transform them to multiplying Wilds. On the main grid 2x, the top right grid 3x and bottom right grid 5x. Naturally these take the place of the scatters so no retrigger can occur but you may still see the Volcano Wilds. Coin win - D'oh! please no!